How do I feel about Valentine’s Day? Well, now, that’s a loaded question if there ever was one. The short answer is I hate it. First, there’s the religious component. The real name of the holiday, if you insist on calling it one, is Saint Valentine’s Day. I don’t buy into saints any more than I believe in the Easter Bunny. It’s interesting to me that they’re both associated with chocolate though. Second, this holiday, for lack of a better word, is cruel for single people in much the same way that Mother’s Day is cruel for an orphan. Last year, a friend of mine’s mother died a few weeks before Mother’s Day. He had to go through the grieving process of losing his one and only mama while being assaulted with corporate concepts of motherly love everywhere he went. It is simply mean-spirited. Not everyone has a mother just like not everyone is in a relationship. It is a stab in the heart for those of us who always seem to be single. You are flaunting it, attacking us with the fact that we are single and you are not. You are rubbing our single noses in your togetherness like a dog who peed on the carpet, but that dog is innocent of the crime. Third, Valentine’s Day is a corporate holiday sponsored by greeting card, teddy bear and chocolate manufacturers, and florists. It means nothing. It means less than nothing. If I were to get a .99 cent Whitman sampler purchased at the last minute at the checkout counter of a drug store from a beau, I’d laugh. That is not romance. That is obligation. This ridiculous notion that all significant others must display their love all on the same day because some dead guy martyred himself is pure folly. That is not what romance is. A corporate, prepackaged, obligatory gift is not how people should express their feelings for one another. Even in the odd and erroneous years that I have been in a relationship on Valentine’s Day, I don’t celebrate it. It’s silly and insignificant. So, how do I feel about Valentine’s Day? I loathe it. I despise it. I keep my head down throughout the first half of February, hoping it will just go away altogether. You can take your chocolates, flowers and greeting cards and shove ’em where the sun don’t shine. Wake me up on February 15th. Posted in misc. business and tagged holidays, love, relationships. Bookmark the permalink. I really like the third paragraph of this post. Well said!!! Silly and insignficant – absolutely. Thankfully, in the UK, once you are older than about 14, you can just ignore it. I never think about it, whether single or in a relationship. Other than to make sure that my partner knows I don’t rate it or celebrate it. 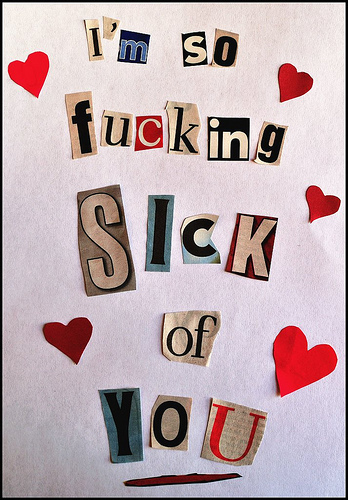 The only thing that occasionally irks me is the way people assume that if you don’t like or mark Valentine’s and Mother’s day, you are obviously unromantic/cynical/uncaring. Hmm. I just think people who love each other should show that in all sorts of ways any day of the year. Here the pressure seems more to be on guys, to give flowers/take you out for a meal on the 14th. Where’s the joy in someone going through those motions coz they feel they ‘have’ to? Yuk.